One of the things I frequently struggle with as a creative professional is deadlines - not because I can’t keep a deadline, but it’s more because I believe in the importance of quality work — and sometimes, due to any myriad of reasons, this takes longer than expected. For people like you and I, it sometimes feels like our projects are out of our control. And indeed, they often are. But there are things we can do to track our progress. These things will not only help you feel encouraged when you’re behind, but will also show your clients and coworkers what sort of work you’re capable of accomplishing. Below is a list of tips that I know I need to start doing to help keep myself on track. I hope you’ll take up the challenge too! The best tip I can give you is to keep a blog. If you don’t have one just for your creative musings, start one. If you’re not the coding type, there’s no better place to start than right here on Postach.io. Just do it. “What am I writing about?" - Ah yes, I can hear you asking that question through the veil of your computer monitor. Start with what you’re struggling with. Leave the comments open. If the Internet is having a good day, people will leave you notes of encouragement and they might even offer words of advice and wisdom to help you! The nice thing about the blog is that you can share it with any community you like. It’s longer than a tweet, but less pretentious than your own self-important website. Beyond that, if it’s at a private address that isn’t associated with your professional site, you can share more openly than you would otherwise with a broader audience. I also recommend writing about the projects you are working on — your hopes for them and your dreams for them — even if they are client-based. If you can legally talk about it, and aren’t under some form of NDA, then writing about it often helps generate more ideas. And if your clients read it and see the amount of thought you’re putting into their work, they’re much more likely to respect your decisions — even if they don’t always agree with them. The thing about a picture is that it does say, well, 'a thousand words'. It forces you to be honest about how a project looks when it’s done, and how it looks when it’s in progress. It’s an intimidating process, of course, but I don’t believe it has to be. Most people are eager to get a look “behind the scenes", and pictures are a big part of that. That’s why the visual books behind popular movies always sell so well. So open up the walls to your works in progress. I don’t recommend this for every client project you do — you need to keep some of the mystery alive for them — but I do think sharing is an important step in the creative process, especially for those of us who work in visual communications. This is something I just started doing for the nonprofit that I’m launching, and I’m loving every minute of it. There’s nothing more satisfying than sharing a list of completed steps in a large project. 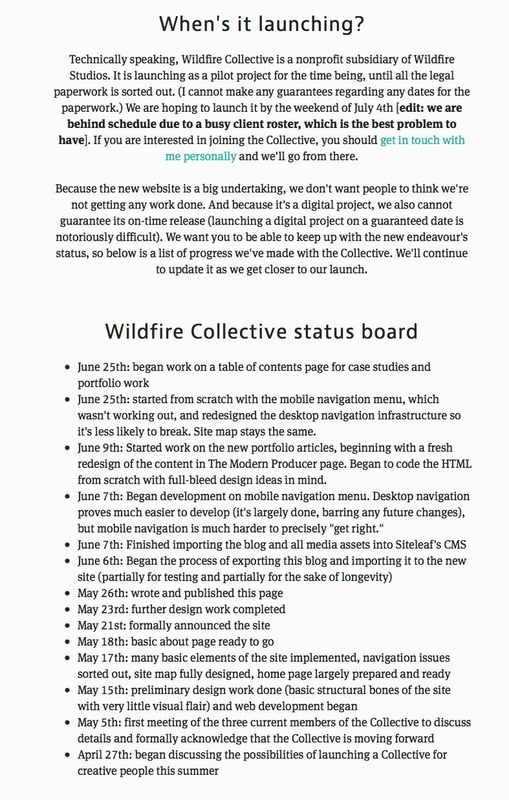 A status board doesn’t work for smaller projects, because there wouldn’t be a point to it. A small project can be completed fairly quickly, and there’s no reason to build up the suspense. As coders like to say, "just ship it". But with a larger project, the buildup to release or reveal can require a little bit more finesse. A status board, like the one for my own project above, allows you to work at a project on your own pace while forcing you to get work done. After all, if you have nothing to share on your status board for a while, you feel like you’ve failed in some small way. So continually updating the status of a project helps keep it moving. It gives it life - and yes, it definitely gives it a little publicity. You might be concerned about clients looking at the status board for a project and wondering why their project doesn’t seem to have the same level of “priority". Well, to put it simply, they won’t. Most clients understand that their consultants are busy with multiple projects, and trust you to manage your time appropriately and in a professional manner. So don’t worry about whether or not a status board could be affecting their view of you. You probably have bigger fish to fry. This one is a much more client-focused detail that I like to insist upon myself. It’s important, I believe, to let clients know about the work you’re doing for them. 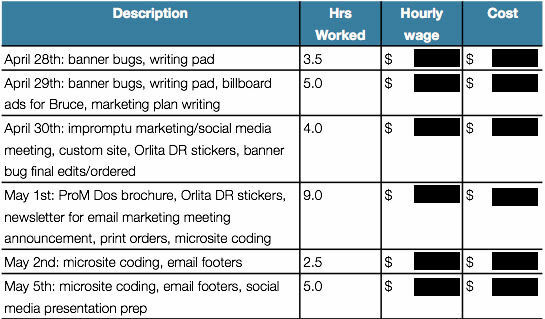 If you work on an hourly rate, I have no doubt that you already track your hours and you keep careful track of what you spend each hour doing. I list all my work on invoices, as you can see below. However, if you’re working for flat project rates, things are a little different. I still recommend tracking what you do each day, and noting it in your final invoice for the project (as above). That gives the client a sense of confidence that they might not otherwise have. For many people, particularly older generations (my father comes to mind), work is associated with time spent on the project. Make sure your clients know you took the time to get it right, and you’ll feel better about the time you spent getting it right too. I also use a service called iDoneThis (pictured above). It’s a cool email service that asks you what you’ve done every day at a user-defined time. 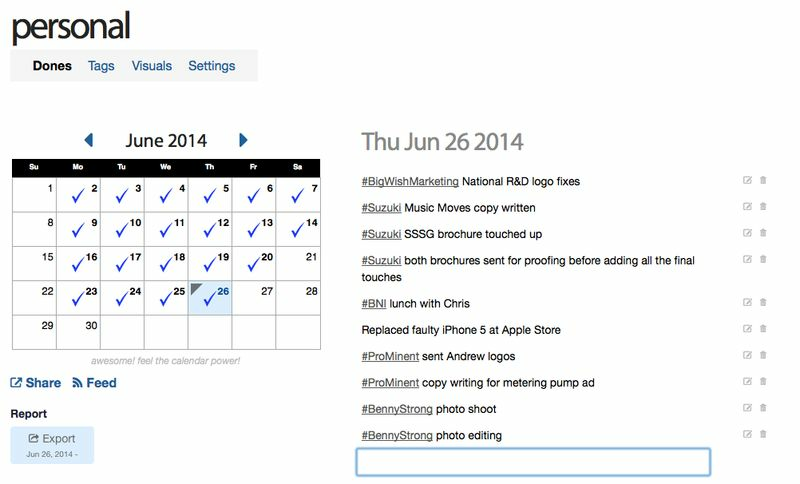 You can use hashtags to track your projects (or clients, as I do), and then just keep a list of all your different accomplishments. That way, some things that I wouldn’t put on an invoice — like a business lunch — can still be noted for prosperity. The bottom line, unfortunately, is that there is no real remedy for some of the problems that come with creative work or consulting: there will always be creative dry spells or days when you find it hard to get out of bed. And I have no doubt that there will always be days when you return home and speak with your best friend or partner and tell him or her you felt incredibly unproductive today. But I do believe we can make those days less frequent with the use of a few select tools. Hopefully some of my ideas generated some thought for you. Get in touch with us on Twitter and let us know what some of your favourite tips are for keeping your work on track!